New BBC drama series, My Mother and Other Strangers, is to begin airing Sunday 13th November on BBC One. Written by Barry Devlin (Ballykissangel, Darling Buds of May) the show is set in Northern Ireland during World War Two, and stars Hattie Morahan (The Outcast, Beauty and the Beast) as Rose Coyne. My Mother and Other Strangers follows the fortunes of the Coyne family and their neighbours as they struggle to maintain a normal life after a huge United States Army Air Force (USAAF) airfield with 4,000 service men and women lands in the middle of their rural parish in 1943. At the heart of the series is an ongoing love story that enfolds Rose and her husband Michael Coyne in a dangerous love triangle with a handsome and charming USAAF liaison officer, Captain Dreyfuss. 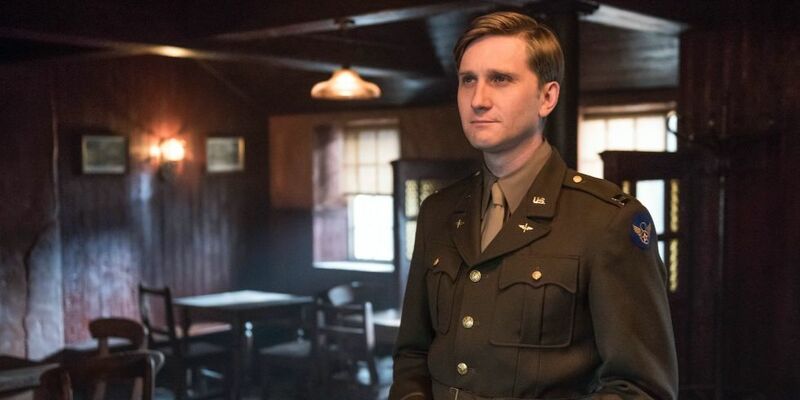 Owen McDonnell (Single-Handed) plays Michael and Aaron Staton (Mad Men) plays Captain Dreyfuss. Meanwhile, the Coyne’s children, sixteen year old Emma (Eileen O’Higgins, Brooklyn), Francis, ten, and Kate, seven, have no idea of the strains under which their parents’ marriage creaks. Also joining the cast are Des McAleer (Hunger), Seamus O’Hara (6 Degrees) and Ryan McParland (The Survivalist) as the neighbouring Hanlon family, whose frustration at being displaced from their family home by the airfield is well vented. Kerr Logan (Game of Thrones) plays Failey, local fisherman and boyfriend to Sally Quinn (Fiona O’Shaugnessy, Utopia) who along with her brother Barney (Gavin Drea, What Richard Did) works on the Coyne’s farm. Charles Lawson (Coronation Street) plays the Parish doctor, Dr Black. My Mother and Other Strangers is the first drama commission to be announced since the publication of the BBC and Northern Ireland Screen Partnership Agreement in March 2015. This joint agreement sees the BBC and Northern Ireland Screen work together to invest financially and creatively in developing an internationally competitive screen industry in Northern Ireland. My Mother and Other Strangers received funding from the Northern Ireland Screen Fund supported by Invest NI. The executive producer is Stephen Wright, Head of Drama for BBC Northern Ireland and the producer is Grainne Marmion (Doctor Foster). Adrian Shergold (Mad Dogs, Persuasion) will direct. The 5 x 60 series was commissioned by Charlotte Moore, Controller, BBC One and Ben Stephenson, former Controller of BBC Drama Commissioning.